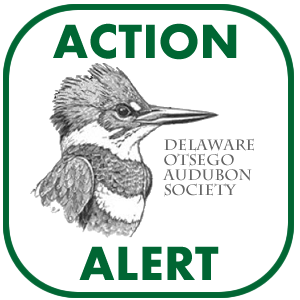 Join Delaware-Otsego Audubon Society on Friday, September 21, 2018 at 7:30 PM at Elm Park United Methodist Church, 401 Chestnut St., Oneonta, NY for a special program about the Alligator River Wildlife Refuge in North Carolina, its uniquely managed palustrine wetland bog and the wildlife present there. Presented by photographer, educator and DOAS board member, Rod Sutton. The program is free and open to the public; free refreshments. 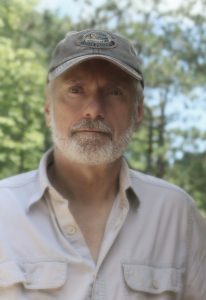 Photographer, educator, and DOAS board member Rod Sutton will share information and photographs of the Alligator River Wildlife Refuge. The Alligator River Wildlife Refuge is one of many National Wildlife Refuges in North Carolina and Virginia. Some of the others include: Roanoke River, Pocosin Lake, Pea Island, Currituck, Cedar Island, and the Great Dismal Swamp. 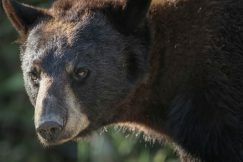 The Alligator River Wildlife Refuge consists of 152,000 acres and is located inland from North Carolina’s Outer Banks. Just south of Nags Head, on Route 64, a bridge crosses Roanoke Sound to Roanoke Island. This route then continues over Croatan Sound to the Alligator River Wildlife Refuge. North of the Refuge is Albemarle Sound which connects to the Alligator River, which is located on the western part of the refuge. The southern boundary leads to Pamlico Sound and the Mattamusket National Wildlife Refuge. A pocosin is a type of palustrine wetland bog found along coastal North and South Carolina. The Alligator River Wildlife Refuge is a pocosin with a floor of peat, crossed by canals and dirt roads. 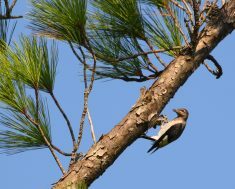 Trees include: Pond Pine, White Cedar, Loblolly Pine, and Cypress-Black Gum swamp. There are large fields near Route 64 that are used for agricultural purposes, growing primarily soy and corn. 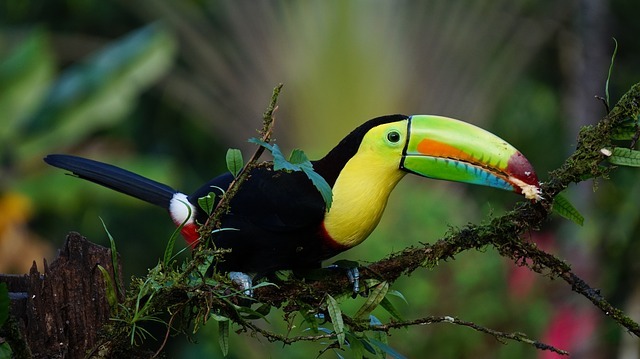 A portion of the crops is left for endemic wildlife and migratory birds. The canals are managed to control saltwater intrusion, irrigation, and prevention of wildfires. 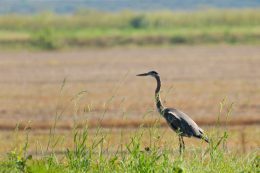 During bird migration, the fields are flooded providing habitat beneficial to an estimated 50,000 migrating birds. The Alligator River lowland includes a variety of wildlife. It is one of North Carolina’s important sites for Black Throated Green Warblers. Over half of all Tundra Swans in North America spend winter in the Alligator River and nearby wildlife refuges. 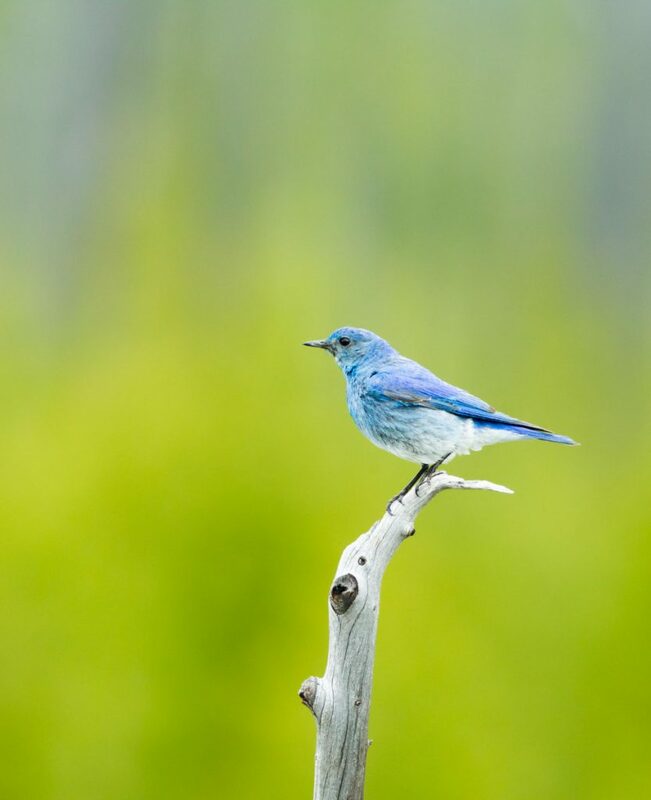 It was recently named a globally significant site for Northern Bobwhite and a significant site for Prothonotary and Prairie Warblers. 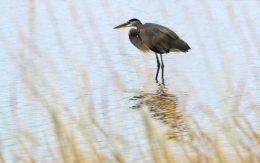 In this area, observers may find over 200 bird species including: Great Blue Heron, Black-throated Green Heron, Tri-colored Heron, Cattle Egrets, Great Egrets, Red Headed Woodpeckers, Eastern Kingbirds, Grey Cat Birds, Cow Birds, White Ibis, Anhinga, as well as a variety of raptors. 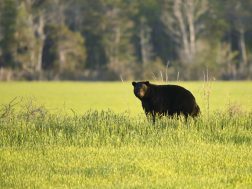 The area is known for its dense population of black bears, which take advantage of the large fields of crops. They are most often seen in the fields just after sunrise, as they head back into the woods and bogs after night-time feeding. 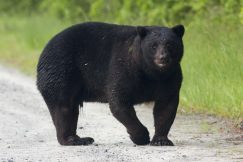 The bears are frequently large for eastern black bears due to their consumption of locally grown crops. 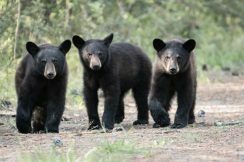 The bears share the refuge with an introduced and managed population of Red Wolves. Rarely seen due to their secretive nature, they can be heard howling in the late afternoon and evening. The population was established as the Red wolf became extinct in the wild. Of course with a name like Alligator River, you would expect there to be alligators. 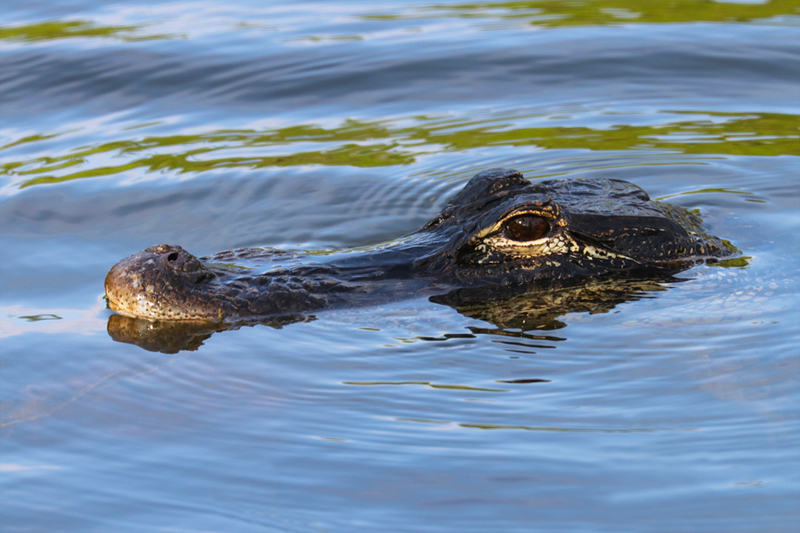 The refuge is part of the northern most range of the American Alligator. They are shy and elusive in the refuges even though they grow to a large size and frequent the canals and waterways. The most frequently encountered reptile is the numerous and varied species of turtles. Dozens are often seen basking in the canals and roadside ditches. 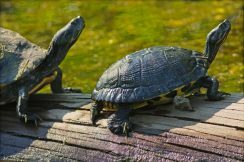 Some species include: Spotted, Eastern box, Chicken, Yellow bellied sliders, Red bellied cooters, Florida cooters, Eastern mud and Snapping turtles. Also found in the refuge are several species of snake. There are: Red bellied and Banded water snakes, Black rat snakes, Corn snakes and Eastern king snakes. The refuge is home to three venomous species: Copperhead, Timber rattlesnake and Cottonmouth. 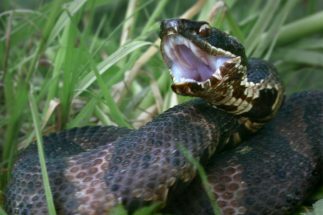 The Cottonmouth snake is near the northern most part of its range. Snakes misidentified as a Cottonmouth north of this area are often the similar non-venomous Northern water snake. 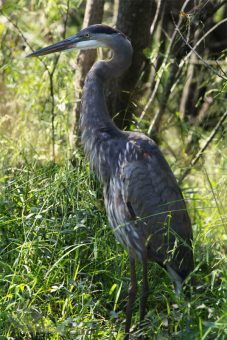 The flora and fauna of the refuge can be seen by foot trail, automobile, and kayak or canoe. The majority of the wetland is dense pocosin and non-riverine swamp forest, which is pristine and inaccessible; however, there is much that can be viewed and a very rewarding experience may be enjoyed. Nearby areas of interest include The lost Colony of Roanoke Island, the North Carolina Aquarium at Roanoke, the Elizabethan Gardens, Kitty Hawk and the beaches of the Outer Banks. Photos below by Rod Sutton; Used with Permission. Rod Sutton enjoyed nature at an early age, dreaming of becoming a wildlife biologist with a focus on herpetology. 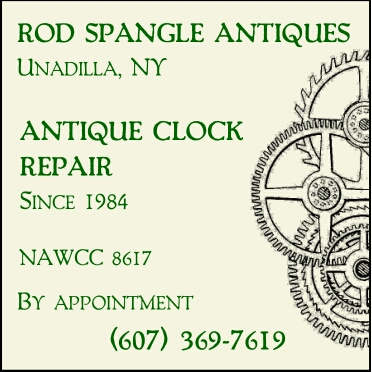 One of his first jobs was at Rogers Environmental Conservation Center in Sherburne, NY. His life found its own path, leading to a career in advertising, commercial, and industrial photography. With 20 years of experience in the field, he accepted a position with DCMO BOCES in 1993 to start a new academic program in Visual Communications. After 10 years in the classroom, he moved to a position as Coordinator of Instructional Technology, retiring in 2012. Blending his abilities as photographer and teacher with his appreciation for nature and wildlife, he now dedicates his time to studying and photographing animals in their natural habitats.